How do you navigate buying and living with art when there's someone else in the picture? We asked Floyd Harris (Closet Daredevil), an Investment Advisor, and Aynsley Harris (Visionary Collector), President of Ebbyrane.com, makers of luxury carry-on luggage, how they negotiate art in their home. Have you ever fallen in love with art at first sight? Is there a piece of art that lingers with you? He said: Yes, a David Grieve oil painting. But no art in particular lingers. She said: Yes. There was a piece in a local gallery of the face of a First Nations Canadian in traditional headdress, done in broad brushstrokes, in bright reds, black and golds. Beautiful. Should have bought it. How would you describe the personality of your home? He said: Traditional and contemporary. She said: Traditional with contemporary touches. The first piece of art they bought together, by David Grieve. She said: I love contemporary, abstract art. How would you describe your taste in [women/men]? He said: Smart, attractive and caring. She said: Tall, dark and handsome? How would you finish this statement: "I knew I was in love with [partner's name] when..."? He said: I first saw her. She said: We lived apart for a year, while I was at journalism school. He sent me monthly care packages and handwritten letters. How would you describe your partner's taste in art? She said: He tends to like more traditional pieces. Who makes more of the household decisions? She said: With regard to art and decorating? Me. What type of person are you: action, thinking or feeling? He said: Action and thinking. Which one of you is more likely to stand up and sing karaoke? She said: He is. 100%. What's the one piece of art or home decor your spouse insisted you purchase that you can't stand but they adore? She said: We don't buy art unless we love it. How do you navigate art purchases with your spouse, especially if you have different tastes? He said: We both must see something we like about it. She said: I can be very persuasive. Is there a piece of art in your home that you both see eye to eye on? He said: Yes, the Dave Grieve in our living room. However, I prefer art framed and hung. She said: Our favourite piece is the first one we purchased together. It's an oil painting by Ontario artist David Grieve. He does landscapes and still life, with a twist. What qualities do you look for in a piece of art? He said: Its ability to draw me into it. She said: The number one element for me is texture. How does having art in your physical space have an impact on you? He said: It makes the space feel warmer and complete. She said: It fills a space and gives it character. I love neutral rooms that showcase beautiful art. Have you ever regretted an art purchase? What's the most unique item you own collectively? He said: A sheet  of uncut US $2 bills. She said: My antiques. I have two extra special pieces that have been carried down through generations of my family. My dining room buffet and grandfather clock. The clock is more than 200 years old. 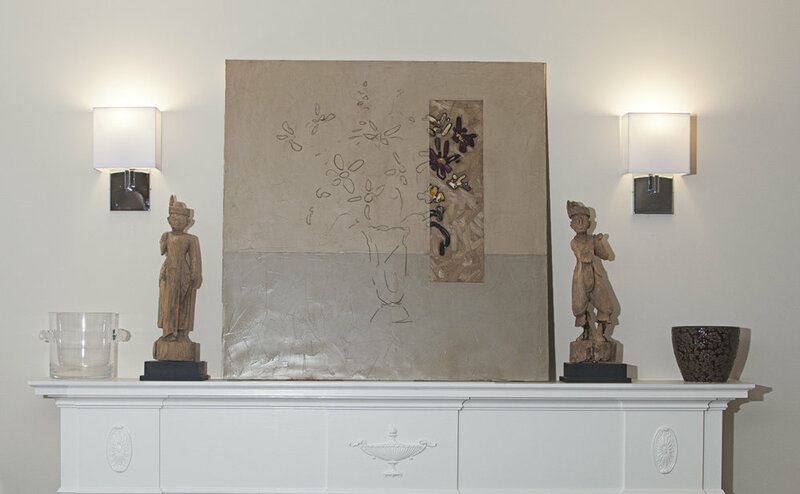 It sits in the front hall of the house, with contemporary art on the adjacent walls. I love to mix old and new. She said: I love large scale art, but smaller pieces can be just as impressive. It all depends on how they are presented. He said: Too many to list. She said: Reality television... did I say that out loud? What would you say to someone who isn't confident in their art taste? She said: Be confident. You like what you like and that's the way it should be. If you could own one piece of art from anywhere in the world or any time in history, what would it be? He said: David Grieve Majestic Tree 48 x 48. She said: Anything by Willem de Kooning.